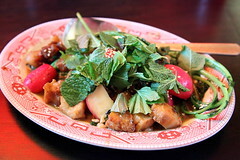 (The Brooklyn location of this venue is closed.) 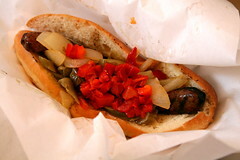 On a boisterous stretch of the Lower Haight, the subtlety of my first Rosamunde sausage was lost on me. 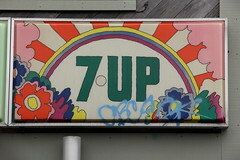 (Based on visits to the New York's previous, Orchard St. location.) The stir-fry proved difficult to untangle. Three bygone color schemes. 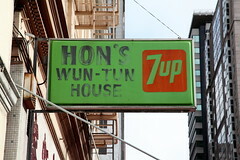 The first, which takes several variant forms, is fairly common, the second I've found only at the Wun-Tun House. The third — widely attributed to Peter Max but more credibly to John Alcorn — survives in many pop-culture collections but is seldom seen in public, and even the market where this psychedelia was sited may no longer be a going concern. See also this Bronx bombshell. 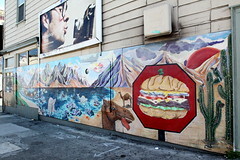 Shown mainly for the coincidental visual echo of camera-loving photographer by sandwich-loving camel (click for a closer look). 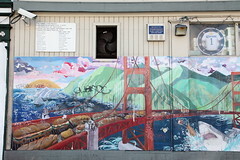 Also, from the other panel of this mural, around the corner: submarine-sandwich congestion on the Tiburon-bound lanes of the Golden Gate Bridge. Fatteh, fattah, and fatta are transliterations of the Arabic word for "crumbs," with the associated meaning of leftover bread being put to good use. 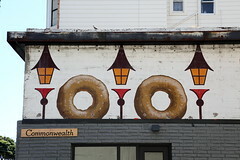 This painted sign was uncovered in 2010 during construction of a "progressive American" restaurant called Commonwealth. Though the typefaces and street lamps suggest an early 20th century birthdate, the folks at Hunt's may have been nodding to the past when they commissioned this sign, just as did the folks at Commonwealth when they preserved it. The donut shop opened in 1952, according to this atmospheric if rambling account of the Mission District at midcentury. 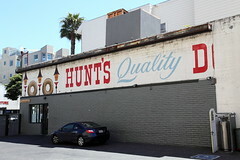 The sign may have faced a parking lot then, as it does now; Hunt's itself stood at the corner of Mission and 20th. 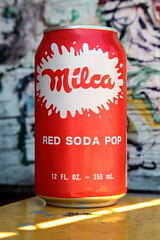 Milca (12 fl. oz., 99 cents) tastes much like cherry soda, but in the absence of any real fruit flavoring, that subtitle describes the contents as well as any. 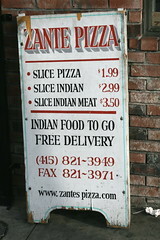 Pizza and Indian food also sold separately. 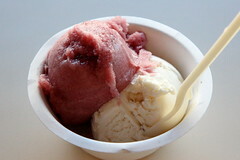 Hidden happy hour at the ice cream parlor: "Jesus juice" sorbet (red wine and Coke) and "secret breakfast" ice cream (Jim Beam and toasted corn flakes, two scoops total, $3.75). This Indian-Pakistani restaurant serves no alcohol. 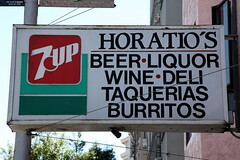 Shalimar's online profile reflects its teetotaling status, but even under a heavy cover of white paint, its sign — a holdover from some previous tenant, years ago — displays a familiar Tenderloin come-on.